Unreflective Ground is grass. It is night. An alien. A ufo 10 feet above the alien. A white 1st light is on the ufo. A white 2nd light is 5 feet above the alien. A 1st cow 5 meters right of the alien is facing left. A 2nd cow 5 meters south of the 1st cow facing the alien. 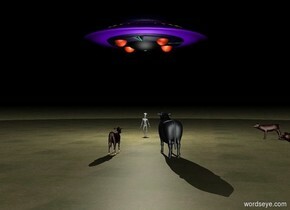 A 3rd cow 5 meters south of the alien is facing north. A 4th cow 1 meter right of the 3rd cow facing the alien. A barn 20 meters infront of 3rd cow.